In a large bowl with pour sides, please, put the Almond Butter. In a small bowl, mash the bananas and then add to the large Almond Butter bowl. Beat the Eggs in a separate small bowl and add to the Almond Butter Mixture. Heat the Light Butter on medium heat in a large pan and pour in medium size pancakes and allow pancakes cook on one side and stick a fork in the middle of all (to vent the pancakes and cooker sooner) set your timer, please, each side two to four minutes turn with a pancake turner and cook the other side. Serving suggestion put Certified Organic Blueberries and or Certified Organic Strawberries on top. I hope that all enjoy these delicious Cancer Free Almond Pancakes. 1. Almonds have been shown effective in the prevention of Cancer because of the selenium it contains. 2. Almonds reduce our heart attack risk by a 50% reduction according to Loma Linda School of Public Health. 3. Almonds lowers our bad cholesterol and was proven in a clinical study by Gene Spiller, the Director of Health Research Studies Center, Inc.
4. Also Almonds protect our Artery walls from damage; the falconoid that are found in Almond skins work in conjunction with the vitamin E and reduces our risk of heart disease. It was proven by doing research at Tufts University. 5. Almonds help us develop strong teeth and bones; it is phosphorus that makes it possible. 6. Almonds, in addition, provide us with healthy fats and aid in our weight loss; we are 31% less likely to gain weight by eating at least twice a week. A study was done involving 8,865 people. 7. Also Almonds lower our rise in our blood and insulin production after our meals. Carnitire are nutrients that boast our brain activity and reduces our risk of Alzheimer’s disease. 9. Almonds also nourish our nervous system, gives us longevity and increases our high intellectual level. According to Ayurveda. 10. Almonds also are the only nut (and 1 of few proteins) that is alkaline forming. When our body isn’t alkaline enough we risk osteoporosis, poor immune function, low energy and weight gain. Please, buy Certified Organic Almonds. Organic does not mean Raw because our Almond Board of California irradiated our United States supply (not marked on package) so no one would get salmonella poisonings not the case in other countries for example-England). 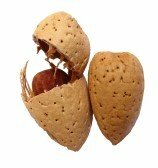 Places to buy Online Certified Organic Almonds Sunfood (com) Italy 2 pounds $18.99 and Nuts (com) 1 pound $13.99 Spain. 1. Bananas help prevent heart attack, blood pressure and stroke because it prevents lipoprotein from oxidizing, which causes it to stick to the walls of the arteries. 2. It is easy to digest because it contains no fat or cholesterol. 3. Bananas are a great source of instant energy for us because it has plenty of carbohydrates and contain natural sugars that is quickly released into our bloodstream. 4. They are rich in Vitamin B6 (helps to prevent irritability and insomia) and contain a good amount of fiber, vitamin C (medium banana provides17% daily vitamin C requirement), magnesium and potassium (helps regulate blood pressure and can reduce the risk of high blood pressure and stroke. Also potassium keeps the blood pH becoming too acidic (1 medium banana provides us with 11 % of our daily potassium requirement). 5. Furthermore, bananas contain tryptophan, it is a type of protein in our body that converts into serotonin-makes us relax, improves our mood and generally makes us feel better and may help fight depression naturally. 6. Bananas contain Fibre, which is important for our good health, helps reduce cholesterol improves blood sugar control : it lowers the risk of heart disease and aids, diarrhea and constipation. 7.They help maintain our regularity with our digestive system and reduces hernias and diverticulitises. 8. Bananas can be used as a treatment of wounds and burns and we can get immediate relief by crushing a ripe banana. 9. Bananas are beneficial for people with anemia because it can stimulate the production of hemoglobin in the blood (high in iron). 10. It fights against intestinal disorders such as ulcers; it neutralizes our gastric juices by it coating our stomach’s lining. It can also kill the harmful bacteria that causes ulcers. 11. Us women who eat 2.5 bananas a day can lower our risk of kidney cancer. 12. Bananas are helpful for people that have allergic reactions to certain foods and who suffer skin rashes or digestive disorders or asthma. Most protein foods contain amino acids and can’t be tolerated by people that have these disorders. Bananas have benign amino acids and these people that have these disorders can tolerate them. All people still check with your medical doctor. 13. Bananas improve our bodies ability to absorb calcium. 1. Berries have antioxidants may protect our cells from damage linked to cancer. Dr Lisa Young, PHD & RD. My sources for my Blog is my own observation and my own cooking recipe, Cancer Society Health Info, lifescript (com), care2 (com), whole foods, Natural News by Diana Herrrington, and The Organic Grocer (com). Please shop at our Cancer Free Smart Shop.